Lamar Jackson threw 59 passes at his pro day on March 29, but you probably heard more about the drill he skipped. Early in the afternoon, when his teammates ran the 40-yard dash on Louisville’s indoor practice field, Jackson shuffled by in socks and slippers, grinning shyly as he slipped through the crowd. Just as he did at the NFL combine, the young quarterback was making a statement by declining to run, one that was immediately met with derision and skepticism: Why would the Heisman Trophy-winning quarterback, arguably the most electric athlete to play under center since Michael Vick, refuse to show off the skill that sets him apart from the pack? Louisville QB Lamar Jackson continues to stuff the stat sheet in his college career and is already a Heisman winner, but will it translate to the NFL should he decide to enter the draft. Lamar Jackson is a quarterback. That isn’t a bold statement: It would be unprecedented (and, frankly, bizarre) for someone with his statistical production to change positions before entering the NFL. But the period leading up to the draft is nothing if not bizarre. It’s a process that assigns value to humans while robbing them of their humanity; it’s art masquerading as science. Production matters, but so does potential, a notion that’s muddied by bias and aversion to difference. And Jackson is very, very different. He’s a generational athlete who can hurl bombs with the flick of a wrist and outrun defensive backs. When he takes over a game, the field spins around him like a globe on its axis. Over the past three months, everyone in and around the NFL has struggled to get a handle on the most elusive prospect in the draft. They’ve asked why Jackson isn’t talking and why he isn’t running, interrogating his unconventional approach. They’ve compared him with other fast, athletic quarterbacks, dredging up the failures of those who came before him and casting aspersions on his ability to thrive at the next level. They could be right. But Jackson’s future in the league won’t just depend on whether he’s ready to enter the NFL, both next year and beyond. It’ll depend on whether the NFL is finally ready for someone like him. 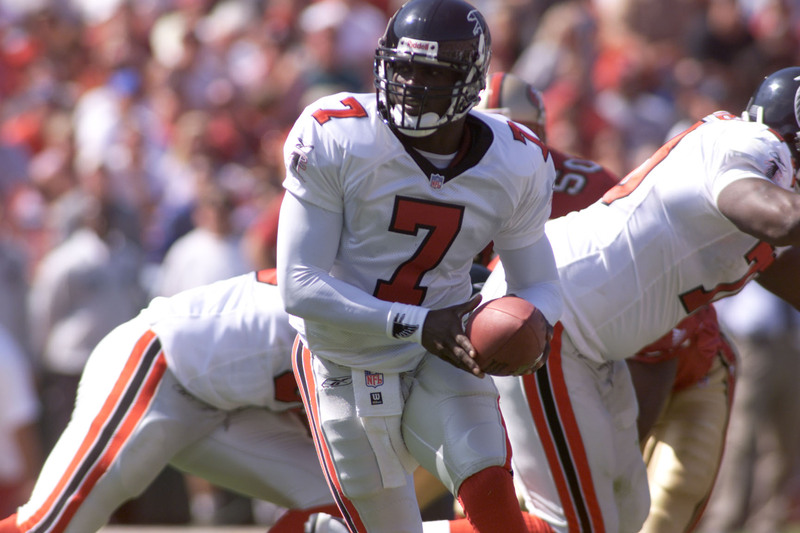 Michael Vick of the Atlanta Falcons carries the ball during the game against the San Francisco 49ers at 3Com Park in San Francisco on Sept. 9, 2001. While the dual-threat label has proliferated in recent years, there have always been quarterbacks who defied the stereotype of a statue under center. In 1972, Chicago’s Bobby Douglass rushed for 968 yards in a single season, rumbling through the open field like a monster truck; during that same era, Fran Tarkenton, a far superior passer, danced around defenders with balletic grace. Roger Staubach, Doug Flutie and Steve Young? All mobile quarterbacks. You’d be hard-pressed to find a highlights package from John Elway’s career that doesn’t show the Broncos passer pumping his legs. And yet, while quarterbacks like Elway were willing to leave the pocket and scramble for yards, that dimension of their game was seen as something of a party trick — a get-of-out-jail-free card. Except for Douglass, whose dismal accuracy forced Bears coaches to rewrite their playbook, mobility rarely factored into game planning. Even Randall Cunningham, the first truly prolific dual-threat quarterback, improvised most of his spectacular runs on the fly. While the Eagles designed a smattering of run plays for the passer, who finished his career with nearly 5,000 rushing yards, his dazzling athleticism was never truly woven into the fabric of an offense; by the end of his career, he barely ran at all. Vick, drafted first overall by Atlanta in 2001, crashed into the league like a meteor, vaporizing decades of conventional wisdom about the quarterback position. The Virginia Tech product boasted an unprecedented combination of explosive speed and arm strength, and his first head coach, Dan Reeves, tried to make use of both talents. But while Reeves incorporated some isolation runs and rollouts into his old-school system (Vick made a number of astounding plays with his feet in the 2002 NFC wild card upset over Brett Favre’s Packers), the offense never really jelled. In 2004, after Atlanta had fired Reeves, they replaced him with Jim Mora, who installed a meticulous, pass-oriented West Coast offense and tried to force his quarterback into the scheme. Vick never fully embraced the system — he later admitted that he didn’t study — but he still thrived when he wasn’t injured, galloping past defenses. In 2004, he rushed for 902 yards; in 2006, he topped 1,000, setting the single-season record for a quarterback. Remarkably, Vick reached his apex at 30 years old, three years after he left football to serve jail time for his involvement in a dogfighting scandal. In 2010, with Andy Reid as his coach in Philadelphia, Vick led the league in rushing yards and touchdowns — but he also achieved career highs in passer rating and completion percentage. Nine years after he was drafted, the quarterback finally found a sense of renewed purpose (and work ethic) and a system tailored to his skills. Reid ran a modified West Coast offense that integrated college principles and added a vertical element, taking advantage of Vick’s arm while opening running space for him underneath. It was, for one season, a perfect marriage. “What I got with Andy was just the total package,” said Vick. Looking back at his career, one can’t help but conjure up a sliding-doors scenario: How much further could Vick have gone if he had met Reid when he was younger? He finished his tenure in Atlanta with a 38-28-1 record, leading the Falcons to two postseasons and a pair of playoff victories. Vick didn’t fail. But he’s still regarded as a star who never soared to the heights he was capable of reaching, and his inability to do so looms every time a new mobile quarterback arises. Vick was the closest thing the NFL has seen to a superhuman; if he couldn’t bend the sport to his will, why should we expect another mobile quarterback to succeed? 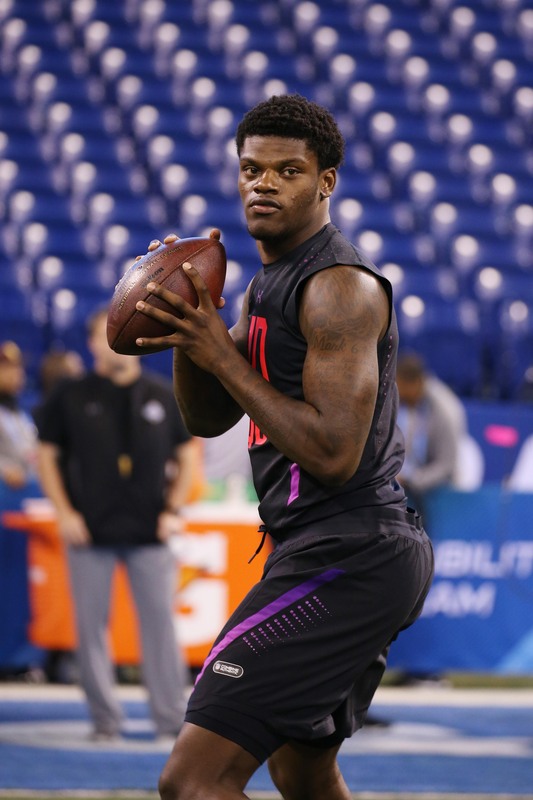 Louisville Cardinals quarterback Lamar Jackson throws a pass during the 2018 NFL Combine at Lucas Oil Stadium, March 3, 2018, Indianapolis. The draft has a way of transforming slivers of information into fully formed opinions, a strange sort of alchemy that belies a simple truth: When it comes to a prospect like Jackson, no one knows everything. 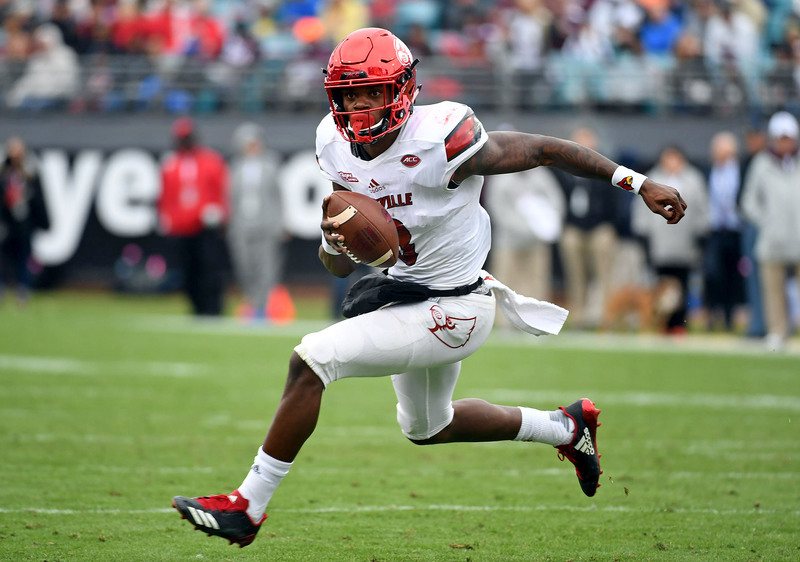 Sure, some coaches and analysts have pored over more Louisville tape than others — but no one has watched every second of the young quarterback’s career, or studied everything that happened around him. Most of us have seen very little. If you had only watched his final bowl game, in which he threw nearly as many interceptions (four) as he did over the course of the entire season up to that point (six), you’d think he was a surefire bust. If you had focused on his highlights, which tend to showcase his most electric runs, you could be swayed into thinking that Jackson should switch positions. 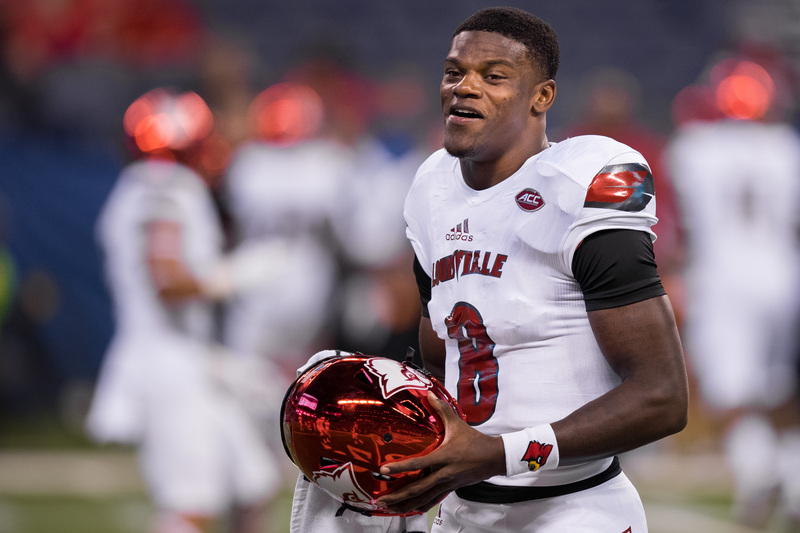 If you had watched a handful of Louisville games from the past two years, you’d see something more complicated: a quarterback who came very far in very little time but still has room to grow. You’d also see the ways in which his game has been misrepresented. “One of the critiques is that he’s a spread-offense quarterback, which doesn’t make sense at all,” said Chris Brown, the author of The Art of Smart Football. “He played for a former NFL head coach and offensive coordinator — they basically run Tom Coughlin’s offense.” (Petrino was an assistant to Coughlin in Jacksonville.) Last season, Jackson threw about 15 percent of his passes at or behind the line of scrimmage, a lower percentage than any of the top quarterbacks in the draft. Jackson didn’t have the same array of quick, easy reads as, say, Deshaun Watson, who actually did operate a spread offense at Clemson. Jackson’s face-off with Watson in 2016, which Clemson won 42-36, offers a wide-ranging look at the quarterback’s tools. Throughout the game, Jackson demonstrated an ability to stay in the pocket and go through his progressions, even as his offensive line collapsed. He made one of his more stunning throws late in the third quarter, with less than two minutes left. Jackson took a snap out of shotgun, scanned the defense and saw Clemson had switched from single high coverage to Cover 2, using two safeties to patrol each half of the field. He trained his vision on the middle of the field to keep one of them from straying too far wide, then whipped to his right and fired a 22-yard pass to a receiver running a go route, zipping it perfectly into the space he created with his eyes. Louisville Cardinals quarterback Lamar Jackson runs for a touchdown during the first half against the Mississippi State Bulldogs in the 2017 TaxSlayer Bowl at EverBank Field. Jackson is far from perfect. He consistently throws passes off-target, especially in the intermediate area. Some of his underwhelming 59.1 percent completion percentage can be pinned on the lack of talent around him; he lost three starting receivers in 2017, and Pro Football Focus reports that his supporting cast dropped 12 percent of his catchable passes, compared with 6.8 percent for Sam Darnold and 7.8 percent for Josh Allen. But his lack of accuracy shows up in the tape. In Louisville’s 2017 matchup with Clemson, arguably the best defense in college football, Jackson completed just 50 percent of his 42 passes. He missed open receivers, especially early in the game, and struggled with footwork and mechanics. For quarterback prospects, a 60 percent completion percentage is something of a Mendoza Line, so Jackson’s ratio gives scouts and analysts pause (it seems to be less of a concern when it comes to Allen, who is reportedly being considered for the No. 1 pick despite his 56.3 percent rate last season). But former NFL quarterback and ESPN analyst Matt Hasselbeck says accuracy can improve, pointing to himself and Alex Smith as examples of passers whose precision grew sharper over time. “Lamar’s accuracy is flawed because of his final step, which can be fixed,” he said. It’s not uncommon for mobile quarterbacks to struggle with accuracy, perhaps because they’ve grown accustomed to leaning on their legs. But Jackson “doesn’t need to be as accurate because of his mobility,” Hasselbeck said. Instead of checking down on broken plays, he can use his feet to pick up yards. In response, coordinators will avoid man coverage, and certain defenders will have to hover closer to the line — which should open up larger passing windows for the young quarterback. The leap from the NCAA to the NFL won’t be seamless, but it might also hasten his improvement, according to Brown. “One of my critiques of Louisville’s offense last year was that I felt like they could’ve given him more easy stuff,” he said, adding that Jackson could end up playing in a more “college-style” scheme in the pros than he did in school — one that exploits his gifts as a rusher to unlock his options as a passer. Alternatively, he could land with an organization that tries to pigeonhole him into a traditional offense, squeezing the joy out of his game like a boss enforcing a stodgy dress code. If the young quarterback disappoints, he’ll be portrayed as the architect of his own fate. But so much lies beyond his control. 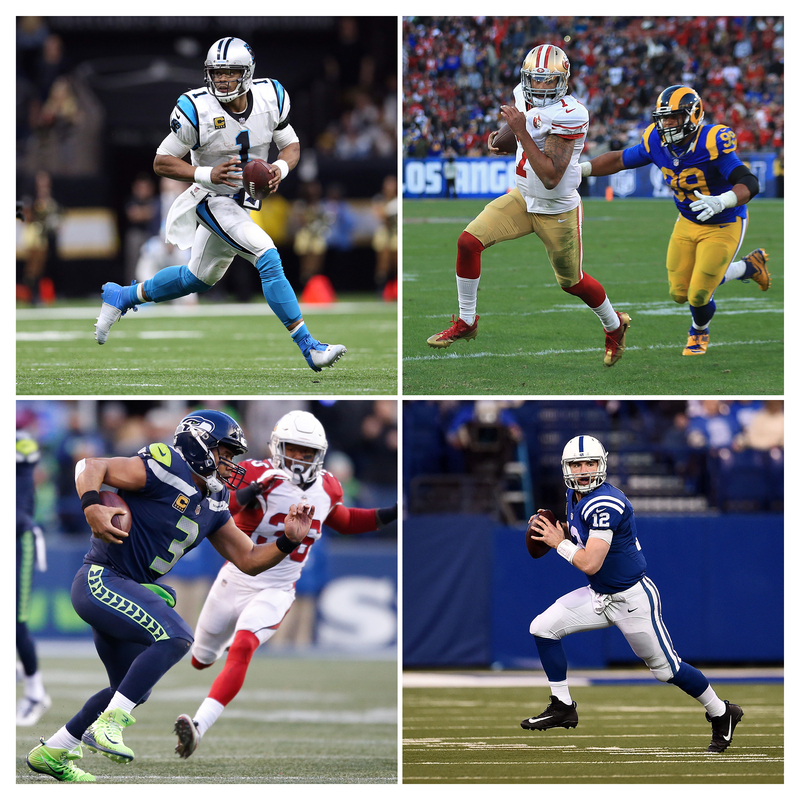 Lamar Jackson is similar to other NFL quarterbacks who can both pass and rush for yards, including (clockwise from top left) Cam Newton, Colin Kaepernick, Andrew Luck and Russell Wilson. One year after Vick reached his zenith in Philadelphia, the Panthers selected Cam Newton, a refrigerator-sized human who rushed for 1,473 yards during his final collegiate year at Auburn, at the top of the 2011 draft, which also saw Colin Kaepernick land in the second round. The following year, Andrew Luck, Robert Griffin III and Russell Wilson burst onto the scene, and rushing exploded. Thanks to the influx of athletic passers and the rise of the read-option, quarterbacks ran for 6,815 yards in 2013, the highest total since 2002. For a moment, it looked like the league was evolving. But quarterback rushing declined in 2014 and again in 2015. By 2016, the total number of yards sank to 6,011. While the drop-off could mostly be explained by Wilson’s injuries and Griffin’s regression, some took it as a sign that the new era of quarterbacks had expired before it ever really took off. Stories were written on the death of the read-option; analysts stressed the importance of finding a conventional pocket passer. Then, last season, something unexpected happened: Quarterbacks rushed for 7,143 yards, the most they’ve totaled in 17 years. What’s behind the surge? It’s partially happenstance; a cadre of athletic quarterbacks entered the league at the same time, much like they did in 2000, the last time rushing topped 7,000 yards. But the recent uptick in mobility also reflects a long-developing trend. As more colleges have switched to spread offenses, shrinking the pipeline of traditional pocket passers, the staples of those offenses have begun to trickle up to the NFL. Some blame necessity, arguing that, because of the spread revolution, quarterbacks can no longer read defenses and offensive linemen can no longer pass block. Others counter that the schemes are proliferating because they’re effective; when the player under center is a threat to take off, offenses no longer operate at a mathematical disadvantage. Teams such as Dallas and Philadelphia, whose quarterbacks ran for 370 and 324 yards last year, leaned heavily on the oft-referenced run-pass option, or RPO. Kansas City’s offense, helmed by — who else — Reid, went full Back to School on the NFL, unleashing a college-inspired arsenal of shovel passes, sweeps and RPOs that capitalized on Smith’s athleticism. For evidence of the league’s rising adaptability, look no further than Houston, where head coach Bill O’Brien completely revamped his offense on the fly. Before Deshaun Watson became the Texans’ starting quarterback, O’Brien rarely employed misdirection; in 2016, Brock Osweiler used play action about 18 percent of the time. Last season, with Watson under center, the team used play action on nearly a third of its attempts. When the young quarterback stepped into the starting role, Houston’s black-and-white offense burst into Technicolor; O’Brien folded many of the concepts Watson used in college into his playbook and fine-tuned them, building around the rookie like a songwriter who’s stumbled onto the perfect hook. Louisville Cardinals quarterback Lamar Jackson warms up before the college football game between the Purdue Boilermakers and Louisville Cardinals on Sept. 2, 2017, at Lucas Oil Stadium in Indianapolis. Nearly 20 years after Vick hurtled into the NFL, the league is still debating whether a quarterback like him can achieve sustainable success. He’s hoping that Jackson will put the question to rest. Mina Kimes is a Senior Writer at ESPN The Magazine.